Japan's sushi maestro Nobuyuki Matsuhisa would serve the couple a traditional Japanese breakfast the morning of their big day. London (CNN) -- For any chef, the wedding of Prince William and Kate Middleton would be the catering event of a lifetime. Details about the event remain closely guarded, but it has been revealed that a relaxed buffet lunch will be served, followed by a more intimate dinner in the evening. Foodies needn't feel disappointed by a mere buffet, though. According to premier UK wedding planner Sarah Haywood, "The queen doesn't do buffets. She will certainly do something fantastic. "When the royal household say 'buffet' they don't mean 'chicken salad.'" Japan's sushi maestro Nobuyuki Matsuhisa is the brains behind international restaurant brand NOBU, much loved by celebrities and high-fliers around the world. For Kate and William's wedding breakfast, he stresses keeping things simple: some steamed rice, Japanese omelette, miso soup and salt-broiled fish. "I chose this menu because it is a traditional Japanese breakfast and I think keeping traditions as part of your life helps to make a strong marriage," he said. 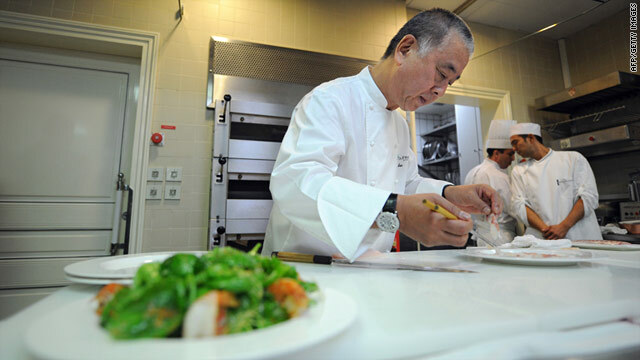 Chan Yan Tak is the executive chef of Four Seasons' Lung King Heen restaurant in Hong Kong, with plenty of experience making Cantonese meals for celebrities and Hong Kong's high society. With three Michelin stars under his belt, Tak's approach to food entails a rigorous attention to flavor, presentation, and the symbolic meaning of particular dishes. For the royal wedding, he suggests an ornate 10-course meal heavily featuring fish and seafood, which in Chinese culinary folklore is symbolic of bounty and good fortune. This heaving bonanza would be kicked off with a suckling pig covered in golden leaves (which represent virginity in Chinese culinary folklore), followed by: stuffed crab, braised lobster, boiled whelks, roasted chicken, fried rice wrapped in lotus leaves, shrimp dumpling soup and double-boiled lotus seeds, topped off (after some hours, we presume) with a fruit platter and petits fours. Culinary expert and author Amy Riolo specializes in Middle Eastern and Mediterranean cuisine. Washington-based Riolo has made frequent appearances on numerous television and radio programs both in the United States and Egypt and is celebrated for her healthy and multi-cultural approach to cooking. Her nine-course fantasy menu would include poached quail eggs (apparently Prince William's favorite dish), followed by ravioli with a royal coat of arms stamp, and plenty of geographically appropriate foods: lots of English cheeses and Kenyan produce. "Since the couple got engaged in Kenya, various Kenyan elements can be found on the menu," Riolo said. And for a sense of very special occasion, Riolo created an edible favor known as "Cleopatra's Kisses," that consists of marzipan stuffed walnuts that are said to have been fed to Marc Anthony and Caesar by Cleopatra. Celebrity Indian chef Harpal Singh Sokhi, renowned for his Indian fusion cuisine, is the host of two culinary shows in India. Drawing inspiration from the historic wedding banquets of India's former emperors, Soki has devised a sumptuous feast traditionally known as Shahi Tastari. Serving the royal meal on a silver platter, known as a Thali, Sokhi would present 15 meat and vegetarian dishes. The meal would begin with a creamy milk drink to calm wedding day nerves. Dishes for the main meal would include shrimps caught from the Bay of Bengal, oysters in coconut cream and green chilies, pit roasted deer and patties made from the rare sweet sorghum vegetable. To end the opulent meal, Sokhi would serve cream pancakes sprinkled with 24-carat gold dust and mangos covered in gold leaves. "This Shahi Tastari menu has the finest picks from the royal households of India and also has usage of aphrodisiac herbs meant especially for the prince," Sokhi said.